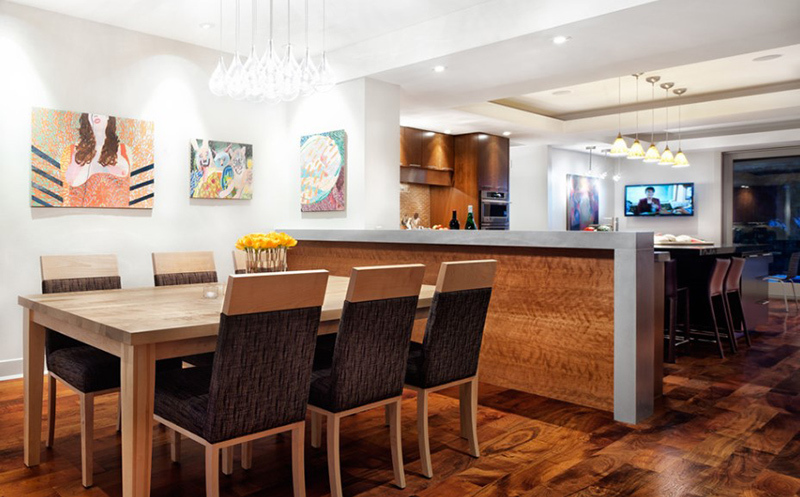 Here is an inspiring round-up of how wood looks like in the dining area. Are you looking for dining room design inspirations? 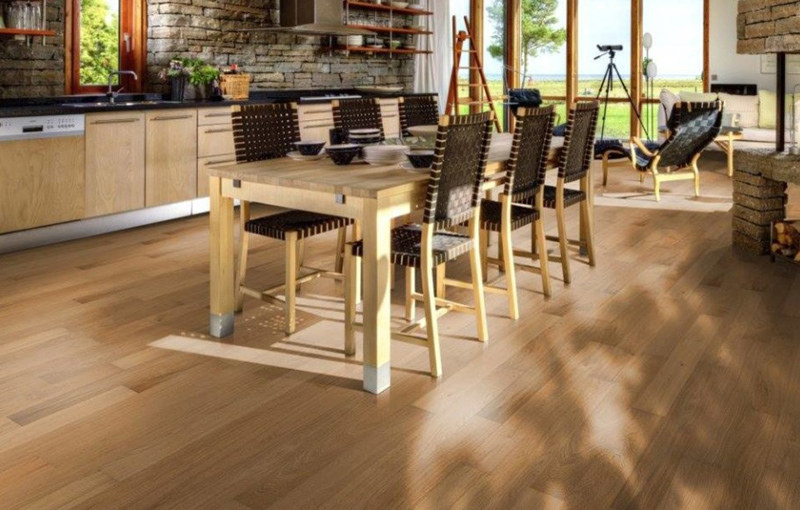 Or are you looking for ideas on what to use for your dining area’s flooring? Indeed, there are so many choices available but what could be the perfect flooring for your space? Will wood work great for your home interior? Wood is one of the most widely used material and it is amazing that it can be used for just anything and for anywhere in the house from the furniture to the ceiling. And yes, it is also a good material for your home flooring. 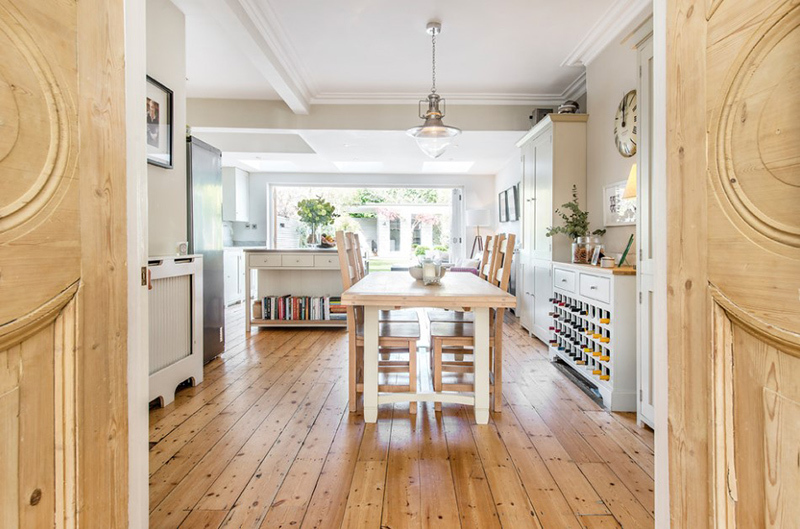 To erase the doubt whether wood is best for your dining area, we are going to feature today a round-up of dining rooms that made use of wooden flooring. These dining rooms come in different designs from modern to traditional ones. Yes, that’s right. You will also get ideas on how you could design your space depending on what your preference is. You will even learn how to arrange your dining room furniture depending on the size and shape of your space through the images that we will share below. Scroll down below and see what we have collated for you. 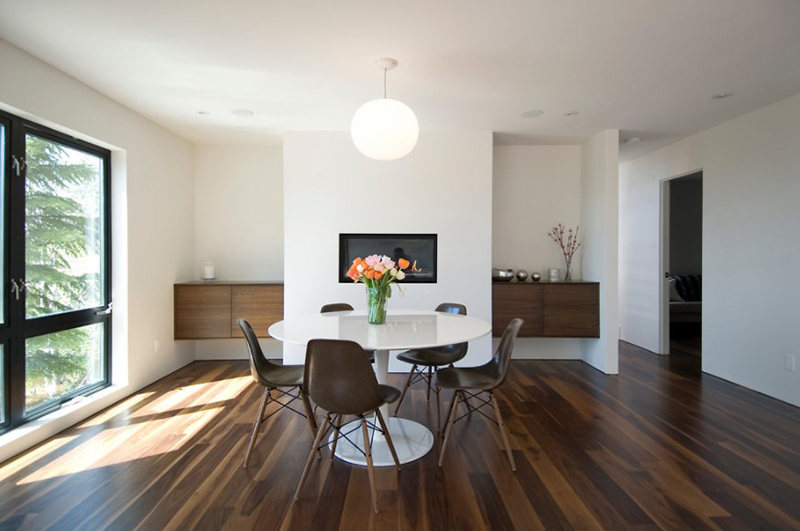 A wooden floor can have a softening effect in the dining area especially if the dining set is sleek and glossy. Wood also looks great with the brick walls too. 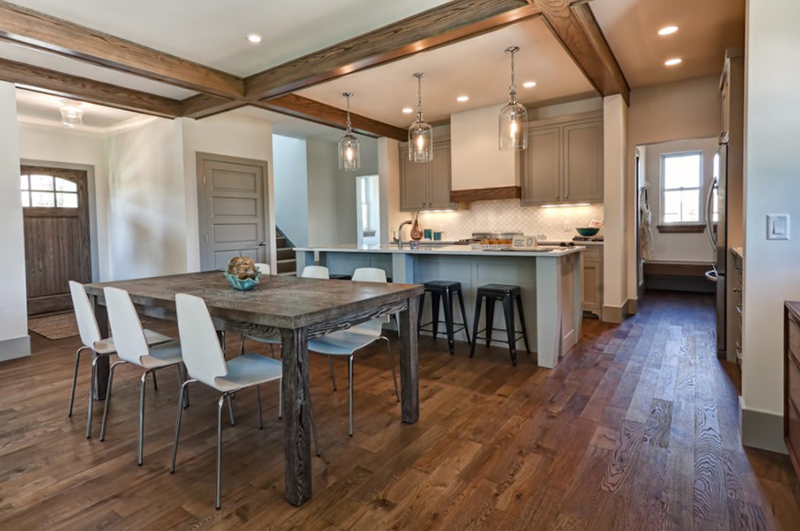 Featured here is a two-tone mid-sized transitional kitchen/dining combo that used medium tone hardwood floors. This area connects directly to the home’s backyard. Isn’t it nice to have a space like this? 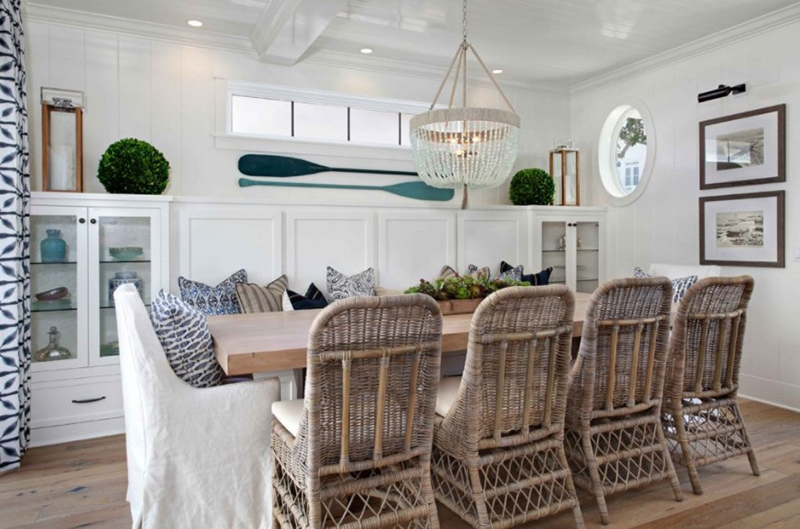 A simple but striking dining space that features a large woven wicker lampshade that punctuates the snowy walls. 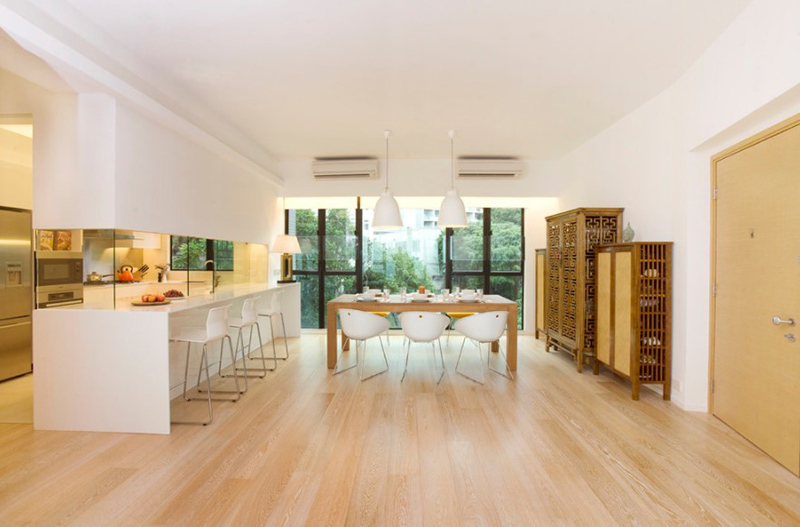 The white Tolix chairs stand out against a polished wooden floor and the reclaimed wooden table. Aside from a table, reclaimed wood can also be used in other ways! Check out how it can beautify your dining room here. 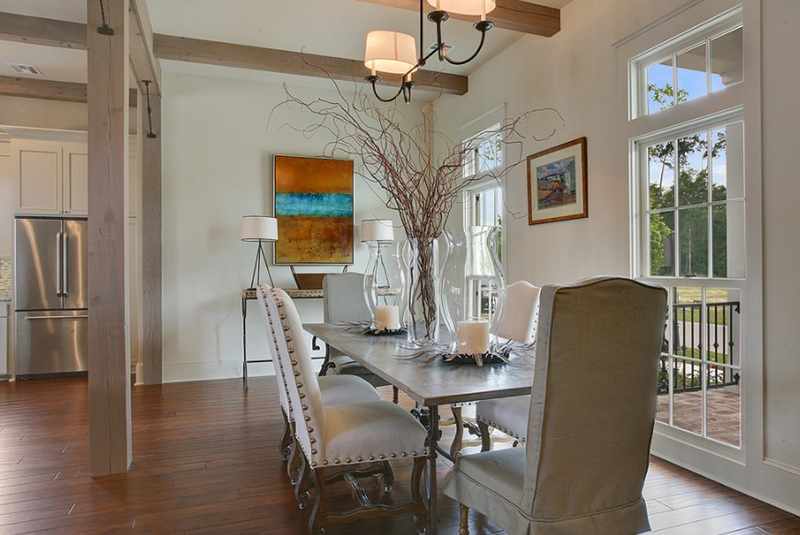 With the use of white walls and dark hardwood floors, the dining area is oozing with elegance! The console table also adds appeal to the area especially with these beautifully arranged decors. 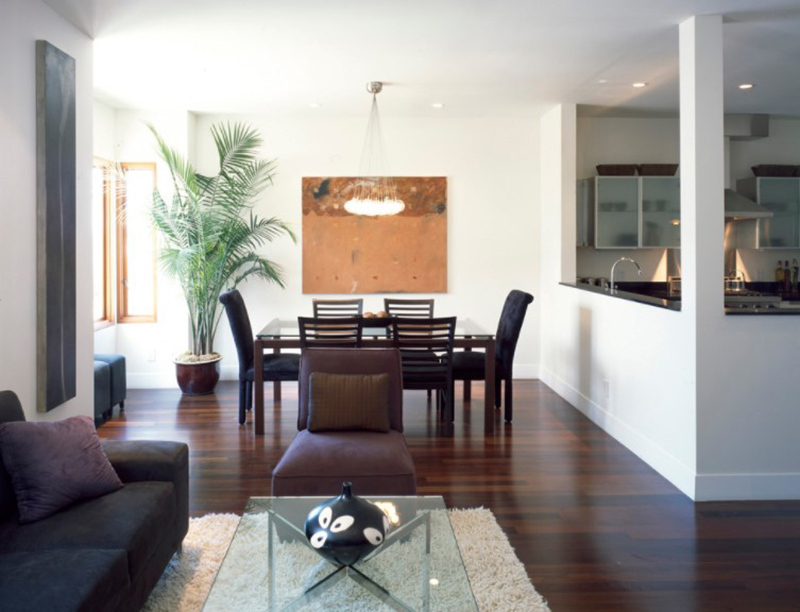 Before you proceed, learn how to clean hardwood flooring in this post. Like what we have featured before, this dining area made use of wooden dining sets that compliments with the architecture of the house. A mountain style dining room design with medium tone hardwood floors. The use of white walls and wooden furniture completes the look of the space. Beige, tan and ivory work great in this dining area especially with light and dark shades of wood. The wood floors in the area are a perfect contrast color to the trim. 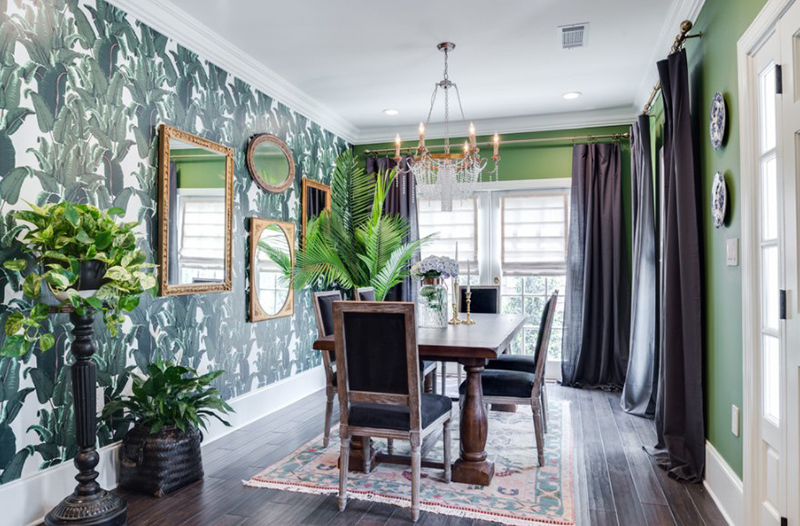 This small eclectic enclosed dining room will give you a forest feeling since it has a leaf wallpaper which is a perfect match with the dark hardwood floors. It is also nice that there are actual plants in it. Light wood is used for the flooring of this house which looks perfect with the white walls and ceilings. It looked even brighter because of the natural light from the glass windows. Isn’t this a nice interior? I love how wood is mixed with other textures and how they used varying wooden textures in here. Also, another thing that made this space beautiful is the lighting. To make sure that your dining has good lighting, check out our tips about it. 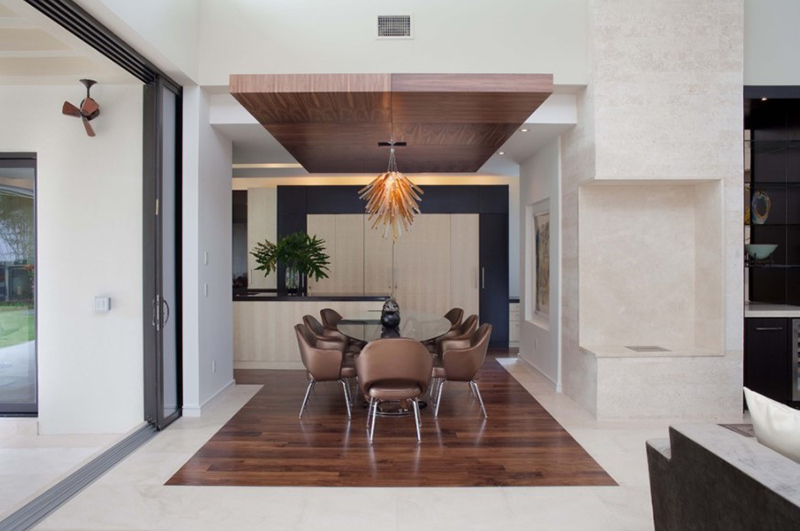 Are you looking for a large contemporary dining room design inspiration? This interior with white walls, dark hardwood floors, a standard fireplace and a tile fireplace surround could be something that you are looking for. 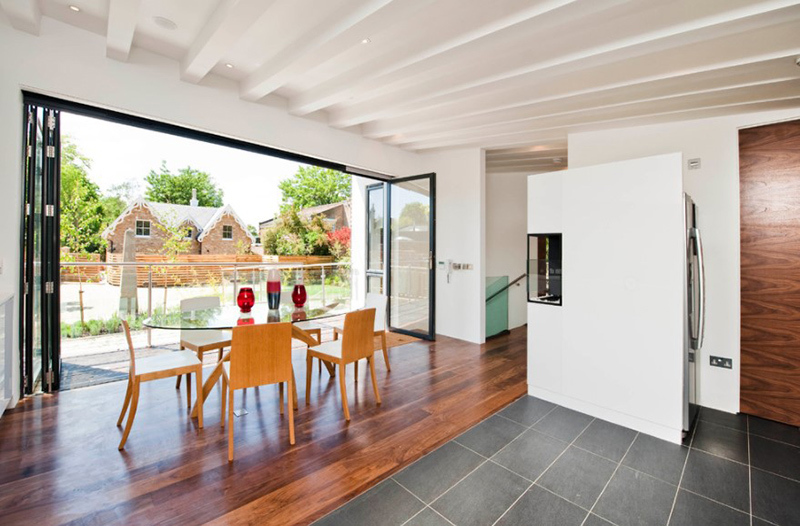 As we can see in the image, the homeowners can see through the dining room to the backyard via a floor-to-ceiling aluminum windows and sliding doors. This also brings natural light into the home which touches everything in here from the dining table to the wooden flooring. This space with beige walls and medium tone hardwood floors is something modern minimalist fans will fall in love with. 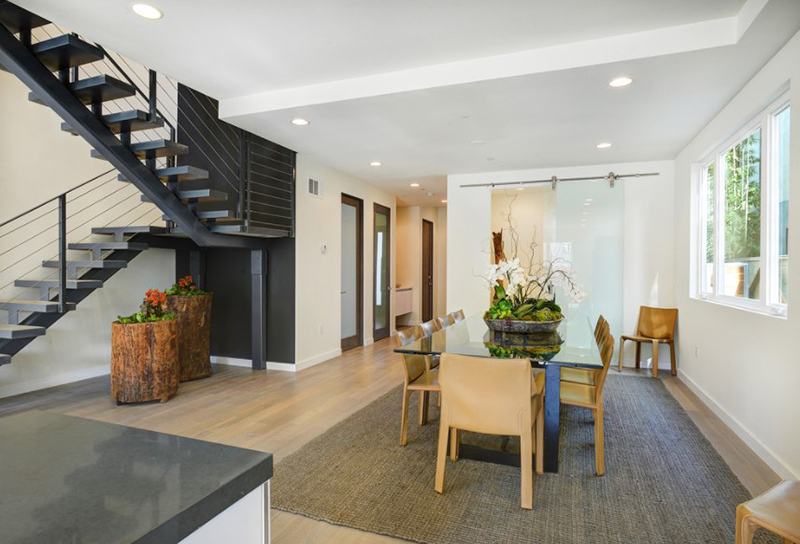 Apart from its use of wood, I love the idea of using a black steel staircase and of course that log decors below it! When a dining area goes more casual, it does not mean you have to lose all the glamour. The secret is getting the balance between elegant features and the usual daily items like the fabulous chandelier mixed with a natural wood table. This is a mid-sized traditional kitchen/dining combo idea with white walls and dark hardwood floor. What add to the appeal of the space are the chairs with large nail heads. Any interior with a combination of wood and white is easy to fall in love with. Even this simple dining area is not an exemption! 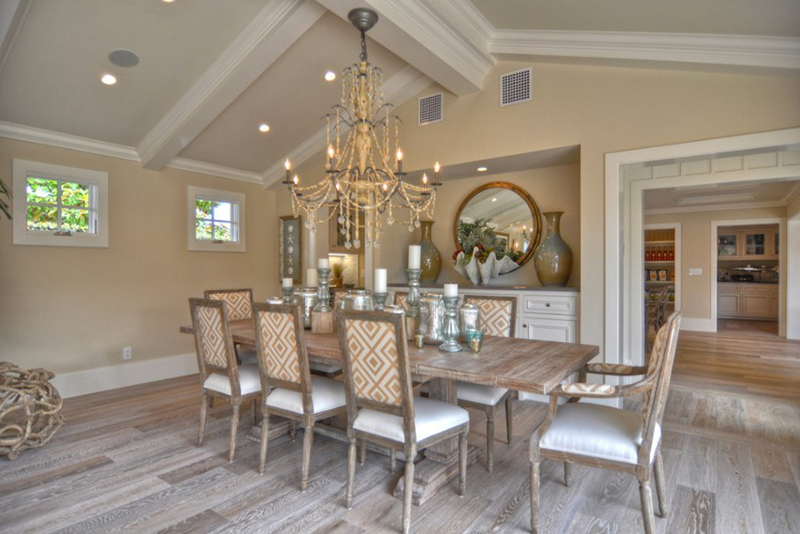 Seen here is a large coastal dining room with medium tone hardwood floors and beige walls. What I love about this space is the framed clothing which apparently has sentimental value for the owner. There are also many other ways to decorate your walls like putting together different mediums to come up with heart-themed wall decors. Isn’t this a beautiful dining area? It sure is! The wooden floor used here looks like a Walnut floor which is a good contrast to its white walls and the ceramic flooring tiles that are used to the other parts of the home. Like House 334, this contemporary home features clean lines and extensive details as well as the combination of wood and concrete. There are many attractive focal points of the interior which include this dining area. Getting the wood look will give more value to your home. It is said that if you are going to resale your home soon, then using wood is a good idea since this is what buyers look for when they are house shopping. Another space from Black Band Design and like the previous entry, it has a similar beach vibe in it. You can see more dining areas with this look here. This dining room used Brazilian Cherry for its flooring and it looks really lovely. It is neat and shiny which brings sophistication to the space. Although it is always nice to define the dining area with a rug, you can still see the impact of wood to the entire interior. Because of the use of wood- whatever is its tone- the dining spaces featured above were a given a warm and more inviting feel. For sure, you can sense that while browsing through the images. Wood is indeed a widely used material not just for furniture but in other areas of the home interior. But if you are not a fan of wood, you can actually use ceramic tiles of various designs or even plain colored ones. Well, you may use whatever you desire for your dining’s floor as long as it works for you and it suits with your interior design. Come back for more dining room design inspiration here on Home Design Lover! I love all these ideas, but I really love the Lido Island photos. I think I just sat there and drooled over those photos the most. Thank you for sharing! Beautiful pictures! We have a wood flooring too and it’s very comfy, I sooo love it!